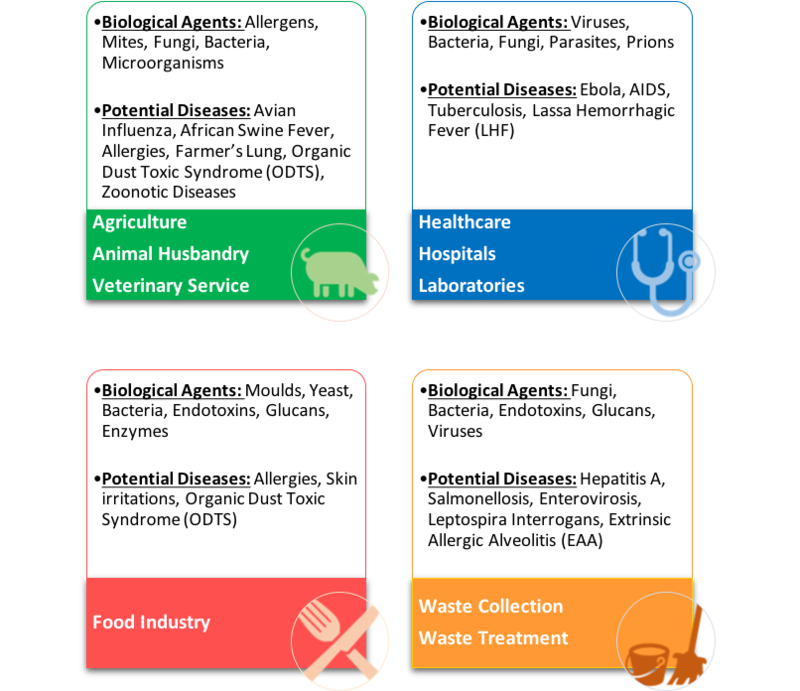 According to Occupational Safety and Health Administration (OSHA), biological agents include bacteria, viruses, fungi, other microorganisms and their associated toxins. They can adversely affect human health ranging from allergic reactions to fatal conditions. They are widespread in natural environment and require minimal resources for survival, becoming a potential danger in workplace. Employee can be harmed by being infected by a biological agent, being exposed to toxins produced by the biological agent and caused allergic reactions. These may include entry through skin or mucous membranes, inhalation, swallowing, animal bites, the urogenital tract, needle stick injuries and cuts etc. Through recent Ebola, African Swine Fever, Avian Influenza outbreaks, we knew that safety measurements are needed in workplace especially dealing with culling operation and carcass handling, where blood and body fluid spilled everywhere or onto frontline operators. Besides animal epidemic prevention, there are many sectors which are of potentially dangers listed as the following. EN 14126:2003 is the standard to determine whether protective clothing offers necessary protection against infective agents, which prescribes the requirements for materials, seams and garments. For protective clothing which passes EN 14126:2003, wording “-B” will be added behind “TYPE” classification, namely “TYPE 3-B”, “TYPE 4-B” and “TYPE 5-B”. A standard is reviewed every 5 years. EN 14126:2003 includes 5 test methods to determine the protection class against several specific biological hazards. The higher the protection class, the higher the protection level. *This standard was last reviewed and confirmed in 2014. Therefore this version remains current. The synthetic blood is a mixture of cellulose, coloring, buffer solution and stabilizing agents. This refers as “screening test”, to predict the pressure at which the subsequent test, using bacteriophage contaminated media, can be expected to penetrate through the material. 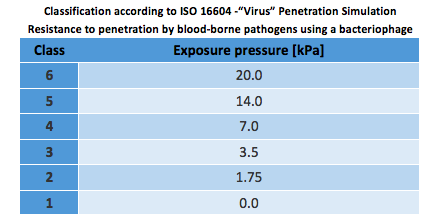 The “virus” test and classification are the same as ISO 16603, the only difference being that contaminant used is a bacteriophage (Phi-X-174) instead of synthetic blood. A bacteriophage is a virus that infects and replicates within a bacterium. The bacteriophage serves as a surrogate to stimulate viruses that are pathogenic to humans. 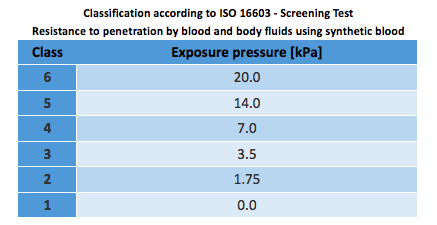 It determines the maximum pressure (between 0 and 20 kPa) on a specimen to be tested during 5 minutes. The test method involves superimposing the bacterial-contaminated donor material onto the test material and subjecting it to mechanical rubbing. During 75 minutes, the sample is exposed to a bacterial contamination under a light mechanical charge and humid. A bacterium solution (Staphylococcus Aureus) suspended in an aerosol is sprayed onto both unprotected cellulose-nitrate membrane and one covered with the test material (the pore size of the membrane is approx. 0.45 μm). Both membranes are subsequently analyzed to establish their bacterial load. In order to classify the results, the penetration ratio (ratio of the load of the unprotected membrane to the load of the protected membrane) is calculated in log units. A pre-sterilized material specimen is fixed in the test apparatus and administered with contaminated (Bacillus Subtilis) talcum powder. An agar plate is placed underneath, and the test assembly is shaken. The particles which penetrate are analyzed after incubation of the agar plate, whereby a non-contaminated test specimen serves as control. The results (mean values from 10 single results at a given time) are measured in penetration log units. ULTITEC offers industry protective clothing against biological hazards from TYPE 3-B to TYPE 6-B, namely ULTITEC 2000, ULTITEC 3000T, ULTITEC 4000 and ULTITEC 5000, which performance levels exceed WHO protective clothing specification option 1 for Ebola infection control. As a conclusion, operators are encouraged to wear appropriate protective clothing in workplace especially in above mentioned industry sectors. This is to ensure sufficient healthcare protection against infective agents which may result in potential diseases with consideration of infective agents, exposure levels, work nature, infection risk and fabric barrier performance. Moreover, performance evaluation of the protective clothing based on these international and industry standards will assist in overall risk assessment, to become a standard in minimizing the risk of workplace infection.